Easter is a very popular time of the year for all age groups, take advantage of this during your next marketing campaign and promote your business with the power of Easter themed giveaways! 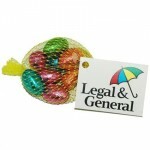 Promotional Chocolate & Branded Sweets at Easter are the perfect choice for promotional events over the Holiday period. Branded Easter Eggs can have your logo and message printed in full colour over the complete branding area to fully promote your corporate identity. Branded Chocolate & Promotional Sweets have to be the greatest ice breaker when introducing potential clients to your stand at a show, in store, at meetings, on the street, mailing campaigns and even team-building events. Foil Chocolate Eggs are a very popular giveaway item during easter time. Easter eggs are the commercial item at Easter, take advantage of this and promote your business! Easter lollies are very popular with children, promote your business with sugary treats! 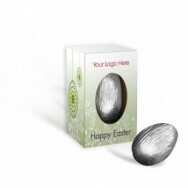 Branded Chocolate Egg is a great corporate giveaway item for this coming Easter Holiday!Promotional .. 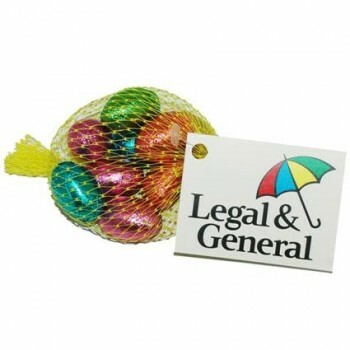 Branded Net of Foil Wrapped Solid Chocolate Eggs is a great giveaway item for this coming Easter Hol.. 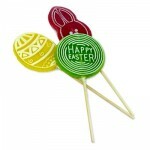 Branded Easter Lollies are a great giveaway gift idea for this coming Easter Holiday!Promotional Ea.. 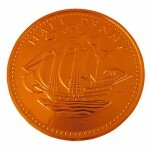 Promotional Chocolate Coin-Varying Sizes is packed inside a foil cover. C-0500Minimum Order Q.. 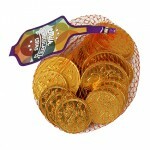 Promotional Chocolate Coin Bag C-0515Chocolate coins in net with promotional tag. Minimum ..